A few months ago, I saw this really cool hair wax/pomade that temporarily dyed your hair. It was super expensive so I couldn’t buy any, so I wanted to figure out how to make it myself. I ended up creating something even better! A color changing hair wax! This wax or pomade will change your hair color depending on the temperature. You can go outside into the sun and it’ll change colors, then go into a cool room inside to change it back. You can also use the warmth of your hand to change your hair color. 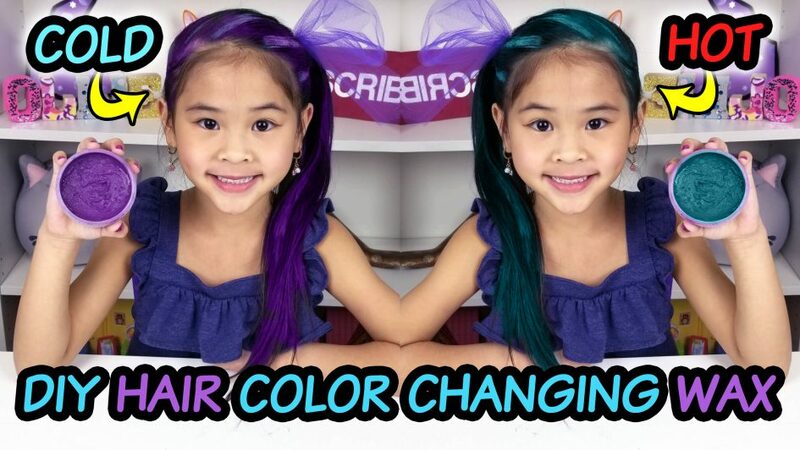 You can put pretty color changing highlights in your hair, or use it all over. When you use the color changing hair pomade all over, it will have a super cool fading effect since the hair near your head is warmer! The color changing hair wax is also temporary, so it washes out of your hair when you shampoo. I decided to use a store bought pomade instead of creating my own since everyone has a favorite of pomade they like to use. But if you have time, creating your own hair wax from scratch is super fun too! Open your pomade jar. If it’s a thicker pomade, microwave it for 10 seconds at a time until it’s all melted. This will help the color changing pigment to mix in easier. Once it is combined, let it cool. You can put it in the fridge to speed it up. When it is ready, the main (cold) color will be the same throughout the jar. That’s it! Make a bunch of different colors and amaze all of your friends!